A large portion of the US today saw a real-world teaching moment about something microanalysts think about every day. 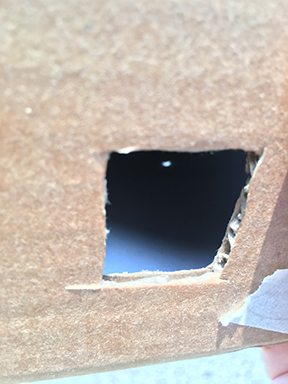 With today’s Solar Eclipse, you could see two objects that have the same solid angle in the sky, assuming you are in the path of totality. 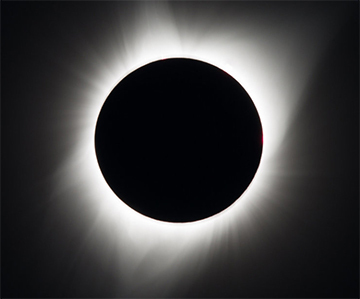 Which is bigger, the Sun or the Moon? 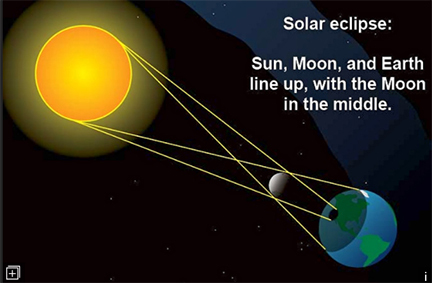 We all know that the Sun is bigger, its radius is nearly 400x that of the moon. Luckily for us nerds, it is also 400x further away from the Earth than the moon is. This is what makes the solid angle of both objects the same, so that from the perspective of viewers from the Earth, they take up the same area in the sphere of the sky. 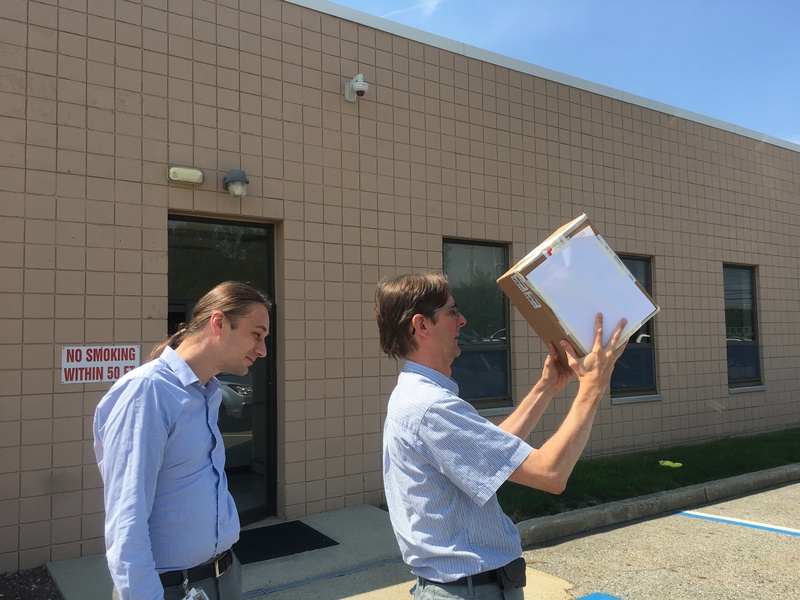 The EDAX team observes the solar eclipse in NJ, without looking at the sun! Why does all this matter for a microanalyst? We always want to get the most out of our detectors and that means maximizing the solid angle. To maximize it, you really have two parameters to play with: how big the detector is and how close the detector is to the sample. ‘How big is the detector’ is easy to play with. Bigger is better, right? Not always, as the bigger it gets, the more you start running in to challenges with pushing charge around that can lead to issues like incomplete charge collection, ballistic deficits, and other problems that many people never think about. All these factors tend to lead to lower resolution spectra and worse performance at fast pulse processing times. What about getting closer? 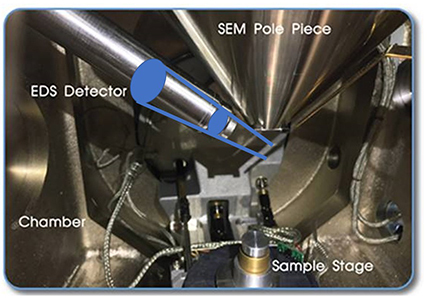 Often, we aim for a take-off angle of 350 and want to ensure that the detector does not protrude below the pole piece to avoid hitting the sample. On different microscopes, this can put severe restrictions on how and where the detector can be mounted and we can end up with the situation where we need to move a large detector further back to make it fit within the constraining parameters. So, getting closer isn’t always an option and sometimes going bigger means moving further back. Figure 3. Schematic showing different detector sizes with the same solid angle. The detector size can govern the distance from the sample. In the end, bigger is not always better. When looking at EDS systems, you have to compare the geometry just as much as anything else. The events happening today remind of us that. Sure the Sun is bigger than Moon, but the latter does just as good a job of making a part of the sky dark as the Sun does making it bright. For more information on optimizing your analysis with EDS and EBSD, see our webinar, ‘Why Microanalysis Performance Matters’.